This distance learning course aims to improve learners' understanding of common ensemble prediction system (EPS) products and how to communicate the probability and uncertainty that they convey. The course designed for operational forecasters and will enhance the skillsets of meteorology students and other interested users. The Introduction to EPS Theory lesson teaches the concepts needed to understand and use EPS products. It lays the foundation for the EPS Product Reference Guide, which describes the following EPS products: mean and spread, box and whisker EPSgrams, shaded percentile EPSgrams, spaghetti maps, ensemble trajectories, plumes, probability of exceedance/occurrence, extreme forecast index (EFI) and shift of tails (SOT), and climatological percentiles. The Guide is optional, and users can access the products of interest to them in any order and use it as a job desk aid. The Guide does not have a quiz. Next, learners can progress through Communicating Forecast Uncertainty. This comprehensive, scenario-based lesson discusses research findings on the effective communication of uncertainty information and provides opportunities to apply them to a North American case. The culminating Interpreting and Communicating EPS Guidance Case Studies lessons provide additional, optional opportunities to use EPS products to forecast different types of weather phenomena in North America and Europe and communicate with various end users. 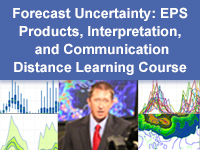 To receive a course completion certificate, you must successfully complete the Communicating Forecast Uncertainty and Introduction to EPS Theory lessons. The EPS Products Reference Guide and the Case Studies are optional.